Are you Embarrassed by Unsightly Spider Veins on Your Leg? Say Goodbye to Spider Veins! The first time any women notices blue, purple or red spider veins on their legs, women tend to have an emotional moment. They’re known scientifically as telangiectasias and spider veins are the more common little cousin of varicose veins. According to the U.S. Department of Health and Human Services, more than 55 percent of women have some type of vein problem. The thin, twist-and-turning veins get their name from resembling spider legs. And if your mom or someone else in the family has them, there’s a good chance you’ll get them, as well. Noydeen Beauty reveals that spider veins on our legs are caused by hormones, weight changes, pregnancy, genetics, injury and lifestyle. Even women who work out vigorously or stand for long periods of time are also at risk for spider veins. 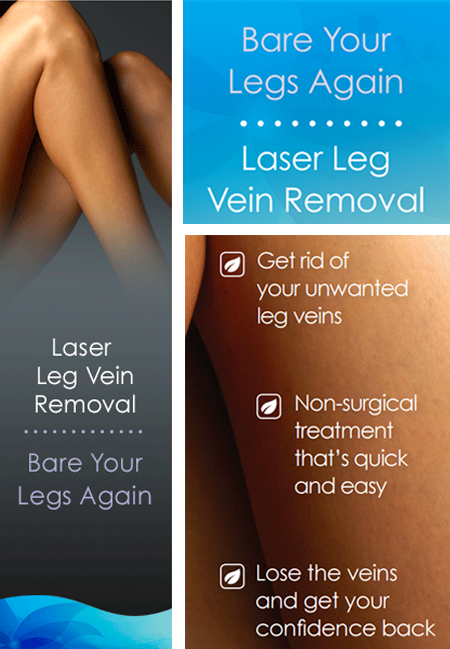 Until now the common treatments for leg veins was to cover them up or suffer through painful, expensive surgery. Noydeen Beauty is here to help with spider vein challenges. At Noydeen Beauty, spider veins are treated with state-of-the-art lasers to diminish the appearance of spider veins with no incisions, no downtime and minimal discomfort. Our laser treatment is designed to just remove blood vessels, spider veins, and red marks–causing no tissue effect or damage to any other elements of the surrounding skin. The laser beam targets the blood vessels, and seals them ups. 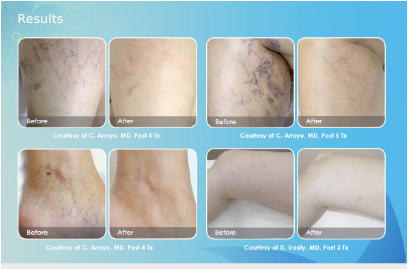 Laser vein treatment are proven, noninvasive method of diminishing or eliminating spider veins, cherry hemangiomas, rosacea and other types of spider veins. After the treatment, the skin is mildly red and swollen, and requires a few hours of cooling to reduce the treated inflammation. Some treated vessels look darker for a few days, then begin to fade and disappear. Generally, patients return to work that day or the next day. The spider veins slowly resolve over 4 weeks. One to three sessions, spaced four weeks apart, give best results. Prior to treatment Noydeen Beauty will review your medical history to determine the severity of the problem and to decide on the most effective treatment. At Noydeen Beauty, our innovative leg vein treatment uses advanced laser technology to target and destroy the blood vessels responsible for spider veins, causing them to visibly disappear. Since the laser targets the blood vessels within the vein, there is minimal or no damage to the outer layer of skin, and clients typically resume regular activities immediately following the treatment. Everyone’s skin is different and at Noydeen Beauty, we encourage a medical consultation to make sure that you are going to get the great results from laser skin resurfacing. Let us customize your treatment plan and get your glow back. It is ideal for spider veins and reticular veins on your legs. Depending on the size of the area being treated, they can take just minutes. Typically, treatments are no longer than 30 minutes. Many patients experience immediate improvement in the appearance of their leg veins following the treatment followed by continued improvement over the next week or so. A series of treatments may be needed to fully clear blood vessels and reduce the appearance of the leg veins completely. Typically one to four sessions are needed for desired results. Patients describe a range of sensations from tingling to the snap of a rubber band during the procedure. You may also feel warmth during and after the procedure on the area that was treated.